Phillip Eugene Taylor (born April 7, 1988) is an American football who is free agent. He was drafted 21st overall in the 2011 NFL Draft by the Cleveland Browns. He played college football at Penn State and Baylor. A native of Clinton, Maryland, Taylor attended Gwynn Park High School, where he was a two-way lineman for head coach Dan Hayes. In his junior year, he was credited with 30 pancake blocks along offensive line. As a senior, he registered 77 tackles with 10 sacks, earning first-team all-state and Washington Post first-team all-metro honors. Regarded as a four-star recruit by Rivals.com, Taylor was ranked as the No. 11 defensive tackle in the nation, in a class highlighted by Gerald McCoy and Al Woods. Taylor took official visits to Maryland and Penn State only, despite also holding offers by Florida, Ohio State, and Virginia Tech, among others. In January 2006, Taylor committed to Penn State. After sitting out the first half of his true freshman year at Penn State, Taylor made his collegiate debut against Michigan and went on to play the season's final seven games for the Nittany Lions. In his sophomore year, he sustained a knee injury during preseason drills but still managed to play 12 games on the season, starting the Nittany Lions' final five games. He was credited with 20 tackles, 12 solo efforts, with 6.5 tackles for loss resulting in loss of 26 yards. He also tallied 3.0 sacks, good for loss of 18 yards, and recovered two fumbles. His finale game for Penn State came at the Alamo Bowl against Texas A&M with five-tackle performance that included one tackle for loss. In October 2007, Taylor was among several Nittany Lions involved in a brawl during a fraternity party at HUB–Robeson Center. He pleaded guilty to a disorderly conduct misdemeanor, and was put on probation by Joe Paterno. 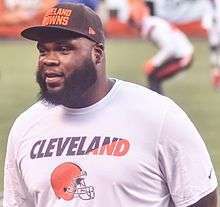 In the summer of 2008, Taylor and Chris Baker were involved in a minor pool party fracas, which resulted in both being ejected from the team. Taylor eventually transferred to Baylor in September 2008 and sat out the season in compliance with NCAA Division I transfer policy. As a junior in 2009, Taylor earned his first Baylor letter, playing all 12 games and started nine. For the season, he totaled 25 tackles (2.5 for loss), an assisted sack, five QB hurries, two blocked kicks and one interception, despite battling a “turf toe” injury through the middle portion of the season. In May 2010, Taylor spent two weeks in Nairobi on a sports mission trip to Kenya with other Baylor athletes. He entered his senior year having shed almost 30 pounds, and started all 13 games at nose guard. He totaled 62 tackles (35 solo)—the most by a Baylor interior lineman since Ethan Kelley in 2002—, seven for loss including two sacks, three QB hurries, two pass breakups and one forced fumble. In his final college career game, the Texas Bowl against Illinois, Taylor had a career-high 10 tackles. For his physical abilities, Taylor was projected a safe first-round selection in the 2011 NFL Draft. He was drafted 21st overall by the Cleveland Browns. Taylor was the highest-selected Baylor defensive tackle since Daryl Gardener in 1996. After a four-day holdout, Taylor signed a four-year contract worth $8.1 million. During his rookie season, Taylor started every game and finished the season with 59 tackles, 4 sacks, and a forced fumble. Taylor was a major standout in his rookie season, outperforming higher picks of the same position such as Nick Fairley and Corey Liuget. In 2011, Taylor enjoyed his best season where he had 59 tackles and four sacks. Taylor (right) and Chris Ogbonnaya in 2014. Taylor was also selected to the Pro Football Weekly All-Rookie team of 2011, with teammate Jabaal Sheard. On September 1, 2015 the Browns released Taylor. 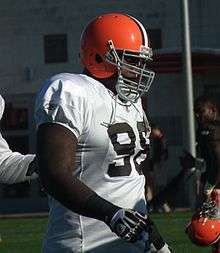 Taylor started 42 games for the Cleveland Browns, posting seven sacks and 69 tackles. On February 22, 2016, Taylor signed with the Denver Broncos. On July 31, 2016 Taylor was placed on Injured reserve due to a knee injury suffered in training camp. The Broncos released Taylor from their injured reserve on August 10, 2016. ↑ "Fall 2005 High School All-Met". Washington Post. 2005. ↑ "Yahoo Sports: Rivals.com Ranking - Rivals.com Defensive tackles 2006". sports.yahoo.com. Retrieved 2016-04-06. ↑ "Troubled at Penn State, Taylor thrives at Baylor". Philadelphia Inquirer. January 27, 2011. ↑ "Former Gwynn Park lineman to transfer from Penn St.". Maryland Community News. August 7, 2008. ↑ "Mission trip to Kenya inspires Baylor's Phil Taylor". Dallas Morning-News. December 27, 2010. ↑ "NFL draft expert: Baylor's Phil Taylor will be selected between picks 21 and 32". Dallas Morning-News. March 29, 2011. 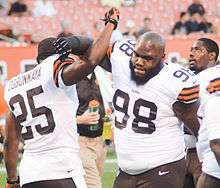 ↑ "Top pick Phil Taylor signs four-year deal: Browns Insider". Cleveland Plain Dealer. August 2, 2011. 1 2 "Denver Broncos sign defensive lineman Phil Taylor". NFL.com. Retrieved 2016-04-06. ↑ "2011 All-Rookie team". Pro Football Weekly. January 18, 2012. ↑ "Cleveland Browns release Phil Taylor". NFL.com. Retrieved 2016-04-06. 1 2 "Broncos add DT Phil Taylor and TE Richard Gordon". www.denverbroncos.com. Retrieved 2016-04-06. ↑ "Broncos place NT Phil Taylor on injured reserve; sign DE Billy Winn". Retrieved 2016-08-01. ↑ Jhabvala, Nicki (August 10, 2016). "Broncos cut DL Phil Taylor from injured reserve". DenverPost.com. Retrieved August 10, 2016. ↑ "Phil Taylor Stats". ESPN. ESPN. Retrieved 29 May 2015. Wikimedia Commons has media related to Phil Taylor (American football).